Carlisle Elementary School Library Media Specialist Carrie Abahazi hangs up water drops with third-grader Ava Anthony Friday morning. Students and staff at the school have raised nearly $500 that will be donated to build a well in a community in Africa. 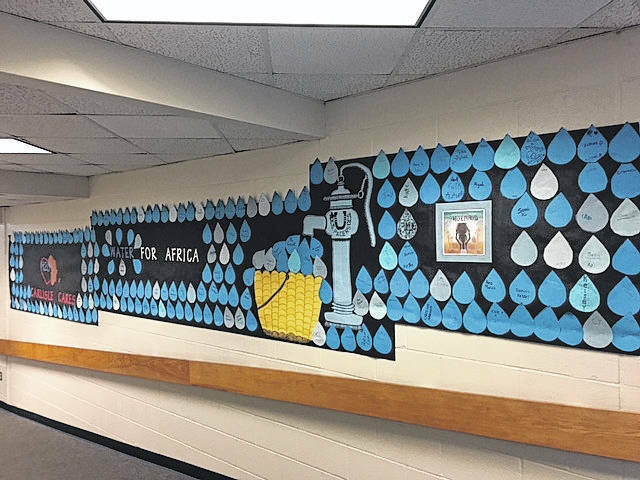 The board in the hall at Carlisle Elementary School displays water drops symbolizing at least one dollar donated to the service project to repair a well in Africa. Abahazi said there were 215 drops on Friday and said that number had grown to 225 by Monday. What began as the reading of a children’s book will end with a well being repaired in Africa after Carlisle Elementary School staff and students raised nearly $500 for the Georgie Badiel Foundation. Carrie Abahazi, the library media specialist at Carlisle Elementary School, said that a few weeks ago she read “The Water Princess” by Susan Verde and Georgie Badiel to all of the students at the school. Abahazi said the book is about a young girl in Africa who has to journey far away from her home to get clean water and then has to carry it all the way back home every day. Abahazi said she thought it would be a good opportunity for Carlisle Elementary to do a service project and teach the students about the impact they can have on a global scale. Abahazi said the school would try and raise $500 to repair a well in a village in Sub-Saharan Africa through the Georgie Badiel Foundation. Abahazi said students and staff would donate money and write their name on a drop of water that they would post in the hall. She said in the first two days she collected 81 water drops along with a total of $155. As of Monday, Abahazi said Carlisle Elementary had collected $490 in donations and 225 water drops. Abahazi said she showed students a video of an African community getting a well for the first time and how joyful they were to have fresh water available. Abahazi said she hopes this project has an impact on the students at Carlisle Elementary School. For information, go to GeorgieBadielFoundation.org. This entry was tagged carlisle elementary school. Bookmark the permalink.